The main focus in understanding Glacial cycles has been on the maximum summer insolation at 65N, yet prior to MPT (Mid Pleistocene Transition) all glaciations simply followed the obliquity cycle. To understand why obliquity is the underlying metronome, we need to consider the integrated summer insolation. Increases in the earth’s tilt boosts insolation at both poles. The precession of the equinoxes only affects maximum summer insolation at one pole because the earth has an elliptical orbit. Once every 23ooo years the Northern hemisphere summer coincides with perihelion and maximum insolation occurs at the summer equinox (June 21). Eccentricity of the earth’s orbit is the crucial factor modulating how strong this maximum value becomes, because eccentricity determines the distance at perihelion of the earth to the sun. If the earth’s orbit was circular then precession would have no effect. 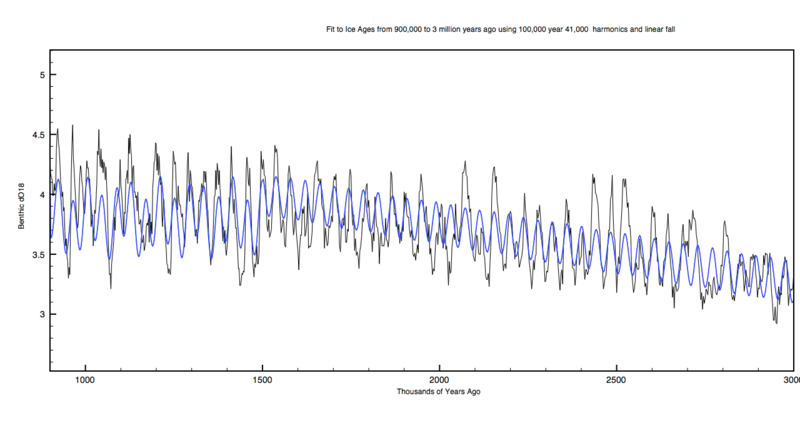 When eccentricity is low like it is today then the effect is small , but 220,000 years ago a much larger eccentricity increased summer maximum insolation 4 times greater than today. Despite this precession/eccentricity effect I argue that the underlying influence on summer insolation is still obliquity, because it affects both poles equally. Figure 1a compares the relative strength of summer insolation at both poles with the modulating eccentricity cycle over the last 600,000 years. If you simply average the North and South maximum insolation together then you can see a perfect obliquity signal – the red dashed curve. This is what insolation would be at both poles if the earth’s orbit were perfectly circular. The solid red curve in Figure 1a is the integral of annual insolation received at the North Pole (~5GJ/m2). The precession signal now vanishes! Total summer insolation simply follows obliquity at both poles. The reason for this is because angular momentum must be conserved during an elliptical orbit. This means that the earth speeds up near perihelion and slows down at aphelion. Perihelion summers may have high high insolation on June 21st but as a result can be up to 20 days shorter than aphelion summers! The end result is the total summer energy received from the sun does not depend on precession at all. It depends only on Obliquity. Figure 1a shows that eccentricity modulates the summer maximum. Figure 1b shows the Ice Volume data LRO4 from 600,000 years ago. Can eccentricity and obliquity alone describe post MTP ice ages? The blue curve in figure 1B is simply a combination of eccentricity and obliquity, both inverted to match ice volume. The curve is not based on any physics, but simply chosen ad hoc. Here it is. Surprisingly the main features of the last 6 glacial cycles in Figure 1b are reasonably well reproduced. This demonstrates how eccentricity plays the hidden role after MPT by modulating the NH summer maximum insolation. However, none of this yet explains why the deepest glaciations, which always occur at low eccentricity, suddenly end with a bang, even though NH summer maximum insolation maxima remain small. The LGM is a classic example. The next glaciation also looks to be even more severe as eccentricity falls to an all time low, last seen 2.8 million years ago! So what causes the deepest glaciations like the LGM to terminate?